No, this commercial is not an SNL sketch. The concept of a flossing system that resembles miniature nunchucks might seem like the household product featured in a commercial parody on late-night TV, but GumChucks Kids, The Ultimate Attack on Plaque® is plenty real. 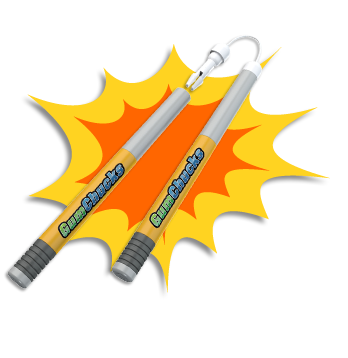 GumChucks Kids, The Ultimate Attack on Plaque® features a two-handle system, with disposable tips connected by a piece of dental floss. Backstory: In 2010 during a lunch meeting at a business convention in Las Vegas, Keith Allen – marketing whiz and dad of two – saw Jeromi Stewart use a handmade personal flossing device. The two combined their skill sets and the rest is history. According to gumchuckskids.com, kids love shooting the disposable tips – as well as the characters (a Hollywood-inspired cartoon series called Tonsil Town™ with characters such as Plaque Man, Ninja Vitis, Molar Bear and the Hygenie, The Flossopher, Slime Shady, and Count Plaqula), game app (Weapons of Plaque Destruction – available in the iTunes store for iPads). Every GumChucks Kids Starter Pack ($9.95) comes with a collectible character trading card. Got braces? ORTHOgami is the answer. Reach. Handles allow the user to easily reach back teeth. Comfort. No more cut off circulation from floss-wrapped fingers. A hygienic process. No fingers in the user’s mouth. Ease. Wrap floss around the tooth, removing more plaque and bacteria.